Eläkeläiset decided to make a one year break in 2007. 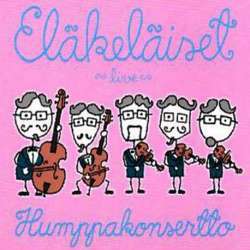 To avoid fans suffering from a Humppa underdose, Finland’s weirdest band released a live album with outtakes from four different shows in Finland during early 2006. The cover artwork is looking hilarious as always, the sound is optimal, the live atmosphere works and it’s certainly a better live album than In Humppa We Trust (1996). Humppakonsertto contains of course a big number of classics from the band’s past. The booklet lacks the credits, so I don’t know how many songs are cover versions and how many are original creations, although I recognised slightly more than half of the tracks. If you like high-speed polka versions of hits by Cameo, Midnight Oil, Neil Diamond, The Hives, Children Of Bodom, Buzzcocks, Bon Jovi, Madonna, Weezer, Judas Priest, Meredith Brooks,… you will love Humppakonsertto. I’m always appreciating again what a broad repertoire Eläkeläiset are using to create their special kind of music. It’s a pity that I don’t understand the short Finnish announcement in between songs, but it’s obvious that there was real party atmosphere at the venues. But if you’re really interested in Eläkeläiset’s most essential live document, you should get your hands on their live DVD Sekoilum Ytimessä which features more than four hours of complete nonsense and humppa action. Best of all would of course be another live DVD by these crazy Finns. I’ve been witnessing two of their live appearances and both were absolutely amazing.